During the winter freshly cut willow rods can simply be stuck into the ground and then woven together into all sorts of shapes. Come the spring – here comes the clever bit – they will burst back into life, growing and evolving as the years go by. The pictures here are just the beginning of the process; each year the new growth can be woven back into to create an amazing organic mass (not one we did, but one day). This is what we’ve decided to make a business of. We love the fact that it is so easy to build these impressive living creations that are also such great fun to be in; the way you can create a living network of domes and tunnels that provides a hidden world, inaccessible to the grown-ups (yet translucent enough for them to monitor what’s going on inside! ); their dappled shade in the summer and stark, geometric patterns and colours of the winter. 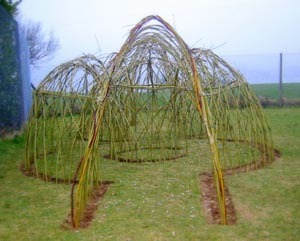 And it’s the gift that keeps on giving: in a couple of years once the willow is established it also provides lots of free building material - new willow rods - to extend the existing structure or start something completely different. As it’s not just living play areas that can be created but outdoor furniture, animal sculptures, fences, gateways, in fact anything you can think of. As you can tell we’re pretty excited about willow – I’m not looking quite so excited in this photo, but it was very cold that day! Lisa originally planted willow to be used for biomass – burning. But then a friend of ours - Liz Child – stumbled on the crazy idea that rather than burning it it could be used to make these beautiful creations (hmm, carbon capture). 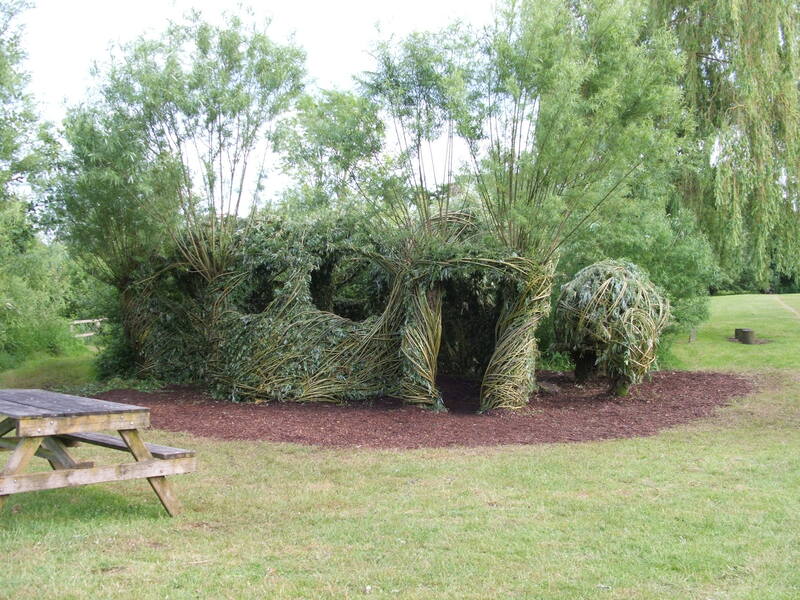 I’ve stayed more with the living structures whilst Lisa is more into dried willow and basketry – watch this space. 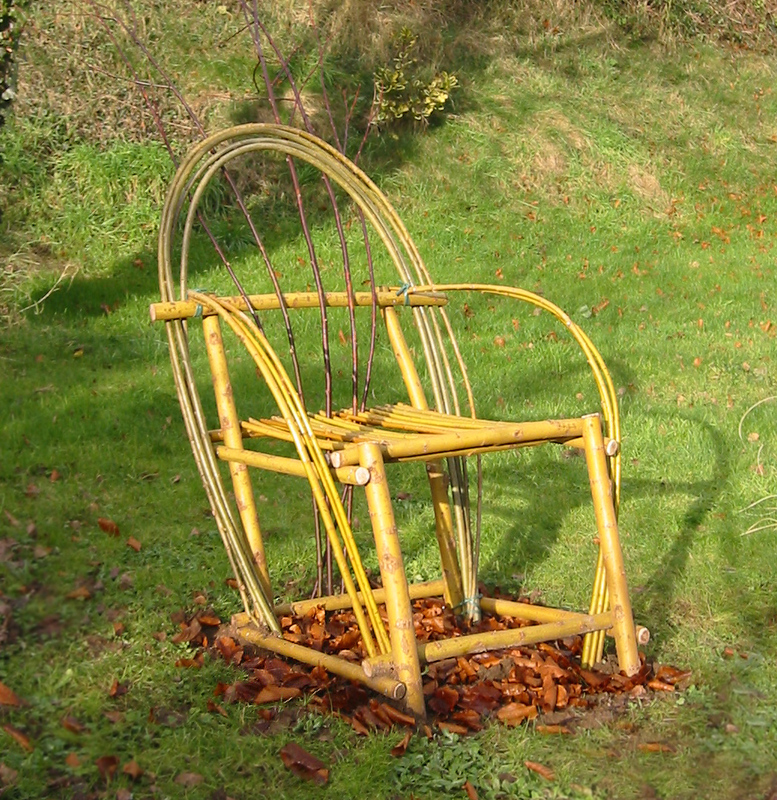 After filling up all of friends’ and families’ gardens with living willow structures and sculptures, in 2009 Lisa and I formed Living Willow Wales to allow us to take our message to the masses. Hopefully I’ve whet your appetite enough for you to contact us to discuss your ideas. I provide a free initial visit where I can ramble on some more about the amazing versatility of willow and show you some more pictures of what you can get up to with it.